So today is my birthday. And, as you may have read in yesterday's post, we celebrated over the weekend with a little barbeque complete with cake and candles. But John didn't want today to pass without a little family party, so we'll be having Dessert Dinner. Dessert Dinner may just be my favorite dinner to make - it just means we do dessert. That's it. Yes, even the kids... we throw in a little fruit and protein for a late afternoon snack so they feel like they're celebrating too (without making me feel like a guilty mama). 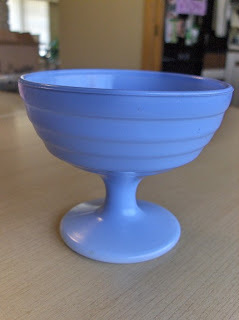 Tonight we'll be making homemade vanilla ice cream sundaes and I can't wait. 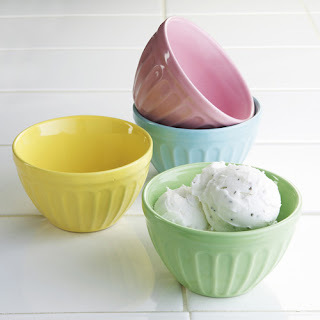 And how nice would it be to have one of these fun ice cream bowls to serve them in? What about this blue Hazel Atlas dish? Or these little numbers that are on sale... mix and match 4 for $20? And finally... 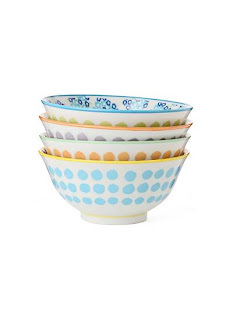 I like the vintage feel of these new bowls. What dessert would you choose if it was your birthday?